The CEVA-X2 is an advanced DSP optimized for intensive sound processing applications. It has been specifically designed to tackle multi-microphone speech processing use-cases, high quality audio playback and post-processing, and embedded sound neural network implementations. 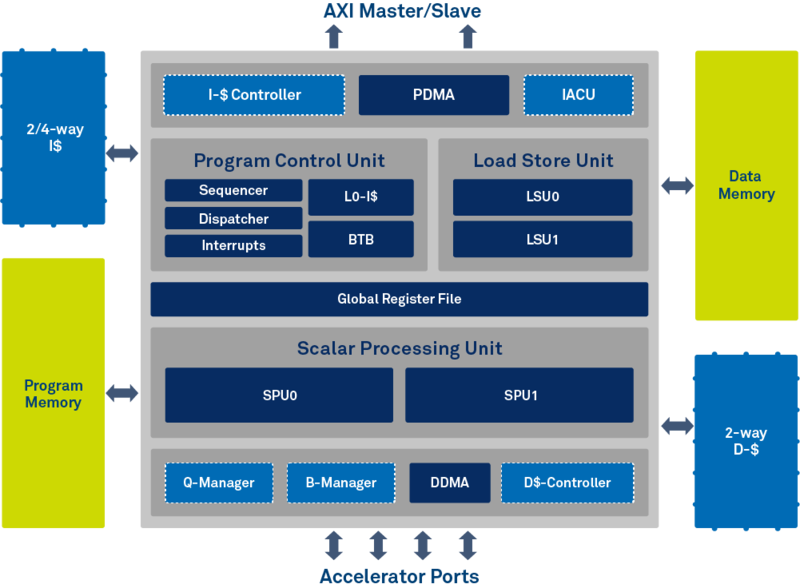 The CEVA-X2 is a combined DSP/controller based on a VLIW/SIMD architecture with a 10-stage pipeline, operating at 2GHz in typical conditions of a 16nm process. Data traffic is managed by the CEVA-X2 optional CEVA-Connect mechanism, which ensures intelligent scheduling for high Quality of Service (QoS) and low latency data transfer tasks and minimizes CEVA-X2 processor load. CEVA-X2 supports your audio/voice/speech software needs using the extensive CEVA Sound Library, CEVA Neural Network Library, CEVA’s ClearVox Voice processing software package, and a vast ecosystem partner offerings of software solutions for any sound application.